A few weeks ago, I had the opportunity to visit Park City, Utah. With only a bit over 7,000 people living there, Park City probably has one of the highest ratios of fine dining establishments to residents. Of course, as a resort town, Park City attracts a great deal of tourism and most of the restaurants cater to the large transitory population. Apparently, the people who go to ski or snowboard at the resorts adjacent to Park City also enjoy high quality food. I had the opportunity to talk briefly with Debbie Axtell from Café Terigo. 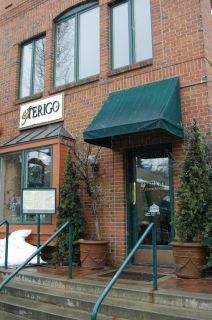 Café Terigo has been a family owned restaurant since it opened its doors eighteen year ago on Main Street in downtown Park City. Ed Axtell, the owner and head chef, and his wife Debbie, have resided in Park City for the past thirty years - and it sounds like they've been feeding people good food that entire time. Ed started his career working in a pizza restaurant before moving to Park City, when the population was considerably smaller (and probably unable to sustain the number of multi-star restaurants that it does today). Debbie saw a need for professional food service and started a catering company. Eventually, their mutual passion for providing good food to the Park City area led them to create Café Terigo. It's not all fun and games though. Ed works ten to twelve hours a day, confides Debbie. His presence is required almost all the time in the kitchen. In fact, Chef Axtell was so busy on the afternoon that I stopped in (while the restaurant was closed between lunch and dinner), preparing for that evening's dinners and events (and the annual Sundance Film Festival brings a lot of guest with particularly refined tastes), that we barely had time to exchange pleasantries and a hand shake. Debbie, who was also exceedingly busy, took a few minutes to sit down and chat with me about cooking. 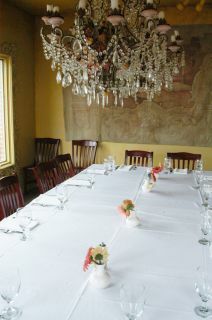 The Axtell's focus on Southern French and Northern Italian styles of cuisine. One of their most popular lunchtime dishes is their Risotto containing smoked chicken, sun dried cherries, and tips of asparagus. The dish began as a seasonal special, but has since become so popular that the Axtell's have it available for lunch almost everyday now. If you've ever made risotto, the first thing you notice is that it can easily be considered a "high maintenance" recipe. It's not terribly complicated - rice, oil, liquid (preferably a nice white wine), and flavorings. However, you need to stand tethered to your stove stirring for twenty continuous minutes. Not only that, you can't make risotto beforehand - it should be served promptly. If you're stuck stirring the risotto pot, how do you prepare other courses or dishes you wish to serve to your family, significant other, (potential) date, or yourself? It's no wonder that risotto is falling off the home chef's repertoire - it's just too much trouble. Debbie let me (and you) in on a bit of a secret. You can make risotto beforehand. Simply cook the risotto as you normally would until the rice is about 3/4 of the way done. Quickly, spread the risotto onto a sheet pan to cool. When the risotto's temperature has dropped, just put it aside into a bowl and refrigerate (to keep it safe from food borne bacteria). When you're ready to finish preparing your meal (or in the Axtell's case, an order comes in), put some into your pot, add a bit of liquid, and finish cooking the risotto. Café Terigo goes through risotto so quickly, the premade batches don't last through the day - but homemade risotto could easily be made up to a week before finishing and serving. As I mentioned earlier, Café Terigo is a family business. There, I met Ed and Debbie's son Travis who started the Purple Sage two doors down from Café Terigo. 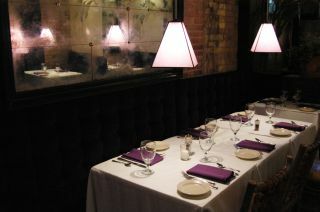 While Café Terigo's interior decoration was sparse and classy, Purple Sage's American Southwest theme let the Axtell's really express themselves with a whole different palette. Contemporary design with a touch of elegance helps make the comparably smaller Purple Sage feel spacious and relaxed. 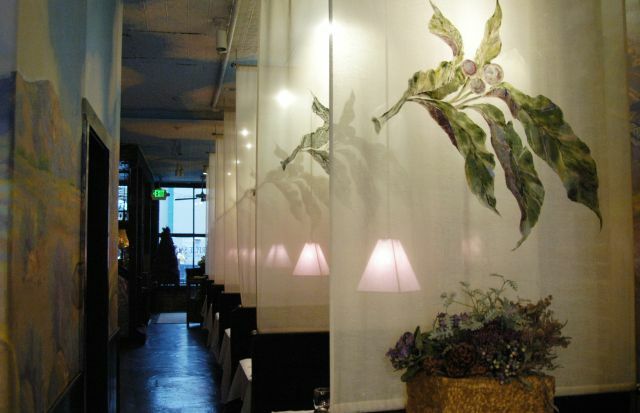 My favorite design aspect was the hanging drapes between booths. The cloth is translucent so you feel private but not isolated with fading purple and yellow lights passing through different numbers of cloth providing an artist effect that even I can appreciate. 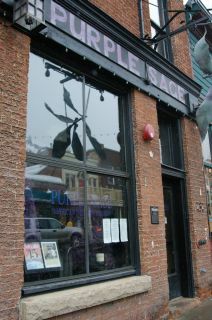 If you ever get a change to visit Park City, make sure you check out Café Terigo or the Purple Sage. Maybe even thank the Axtell's for the risotto tip that they gladly shared with Cooking For Engineers. Michael, you should get the new (2004) edition of "On Food and Cooking", the same risotto tip is given there (p. 475). The link in the "Recommended Reading" section is out of date too. What timing! I just received my copy of the updated On Food and Cooking this evening. Sorry I am a stranger. I am so amazed by your enthusiasm for cooking. I've been to Park City. It's a "cool" place. Great site. I'm not an engineer (well, I've got one on my doctoral committe), but this site speaks to me on so many levels. the rice tip is good, but i find foodsubs.com to be an easier site to use- and it doesn't require registration. 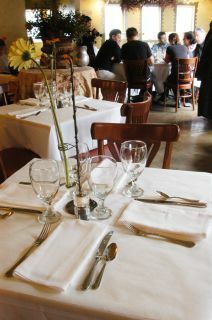 You really should visit Snake Creek Grill in Heber if you are in the Park City Area ( www.snakecreekgrill.com ). It is well worth the trip. 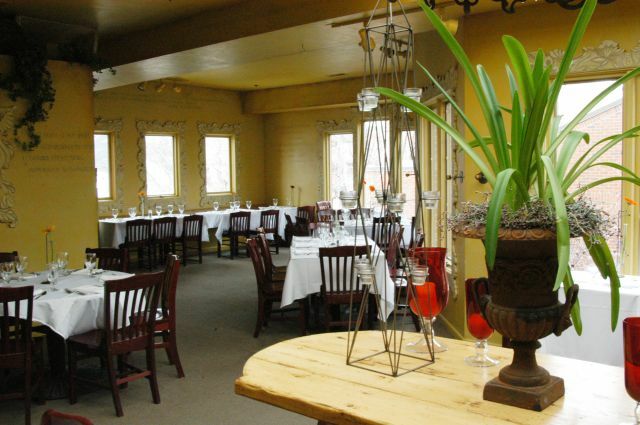 One of my favorite restaurants when I lived in Park City years ago. I have written a lot about Park City restaurants on my web site The Reluctant Gourmet at www.reluctantgourmet.com but never Cafe Terigo. I think that's because my wife and I had one of our most embarrassing moment there when our very young daughter accidently threw up on the couple behind us. Lucky for us we were friends with the couple and they completely understood.